As the weather gets warmer, the insects and bugs make their presence known. With outdoor events having these uninvited guests can be a real buzz-kill. For the last several years, the concern of disease-carrying insects has become a large concern. To make matters worse, most commercial insect repellents contain DEET, a highly toxic substance and not really suitable for children or pregnant women. DEET is also harmful to wildlife and water sources in production and during use – especially to birds and aquatic life. DEET has been found in approximately 75 percent of U.S. water sources, including the Mississippi River. As a natural preventative, many have begun placing pungent smelling flowers and herbs in doorways as a way to keep bugs and especially mosquitos at bay. I even made homemade citronella candles last year to keep the mosquitos away. But we can’t always go to these measures – especially when we are away from home. After reading about a study in Thailand in 2001 about successfully using several essential oils to repel three different species of mosquito (both day-biting and night-biting) for eight hours, I wanted to give it a try. 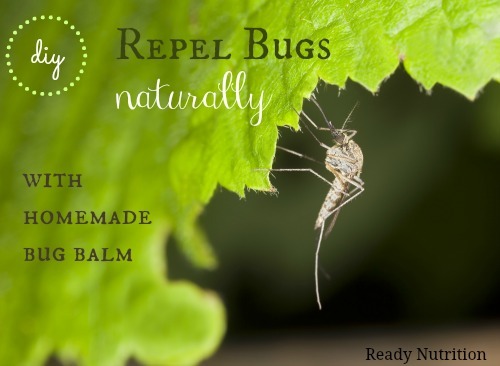 The study used essential oils like citronella, lime, turmeric and basil and found them all the be as effective as using the insecticide DEET. I decided to attempt to make a homemade bug balm that would repel bugs while my family was outdoors. So far, we’ve had a lot of success with it and I wanted to share it with all of you. The smell is much more pleasant compared to insecticides and it’s just as effective. Using a double boiler, bring water to a boil and lower heat to medium-low. Add the coconut oil and shea butter and allow the two ingredients to melt. Add the beeswax and stir the granules into the coconut oil mixture, until completely melted. Ensure that the oils and beeswax have completely melted. Remove the pan from the heat. Let the liquid cool for 3-5 minutes and then whisk in the essential oils. Whisk well to ensure everything is combined. Pour the liquid into your jars. Allow to cool, uncovered at room temperature, before capping. Keep the salve at room temperature for easy application. If the salve is exposed to extreme heat, it can melt or become very soft, so use caution when opening, if the jar has been left in a hot car or the sun. You can make a bug spray using these essential oils by omitting the coconut oil, shea butter and beeswax. Just add the essential oils to equal parts of witch hazel and water. Remember – more oils make a stronger bug spray! Next time you are outdoors, apply this balm to exposed areas of the body. If you are outdoors during strenuous activities, reapply when needed.